A tiny home in Plain, Washington. Owned and shared by Andrew Campbell. This is so perfect! I love everything about it. Can I ask you to give me any details on that sweet little wood burning stove you’ve got there? What is the brand? Where did you find it? How does it work for you? Does it heat nicely, your small space? Are the beams engineered? Like many 1×4’s in a mold, glued together to make the arched beams? i love this tiny house!!! i am tearing down a sad old camp trailer that nobody loved, so i can build the camper of my dreams. 🙂 i am gonna use this one as my template! this is a beautiful and warm pull-behind. thanx for sharing and inspiring. Lovely little build. Adore that tiny stove. Who manufactured it? Where is the bath room? Now that is a nice tiny wood stove. Where did they find that? Does he live in this full time? What does he do for a bathroom? Love the design and careful details. Lovely. If you look at the second picture, you can see tank and battery monitors. Looks like he’s using an RV style toilet and shower setup. Beautifully done. I build them should you want one, price depends on detailing and materials. Tows wonderfully. Rv stuff is junk so I don’t use it. Amazing… What would it cost me if you were to build me one lust like it? No tanks at all, composting toilet. 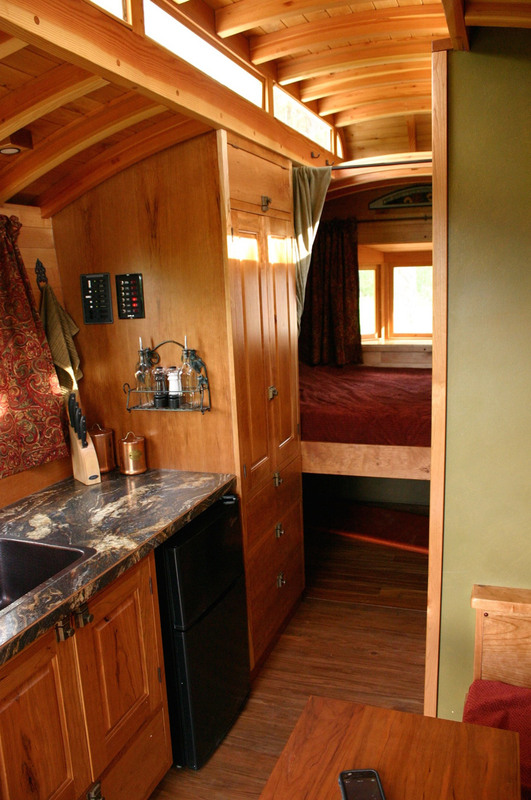 Beautiful, I love the gypsy wagon feel of it. That stove looks like it’s just about the tiniest one I’ve ever seen. I had trouble finding a tiny stove for a yurt that I lived in a while back. I’m curious, is this a stove designed for a boat? I found a few of those in my searching. This is beautiful, and so thoughtfully rendered. 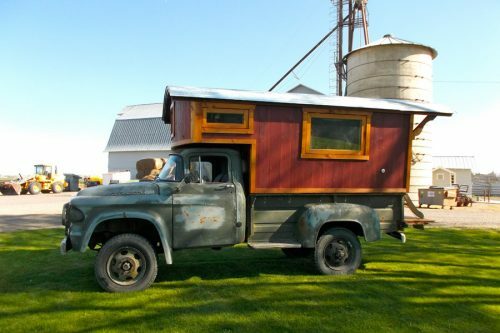 The craftsmanship is clearly evident, and it harkens back to the Vardo of old while embracing a more modern, simple aesthetic. I would love to know the brand of the wee stove Andrew has chosen to use in his home…I have been looking for just such a thing. Ship stove, no? But what maker? Gorgeous roof framing, love the mollycroft! and the visual warmth radiating copper and tiny stove! Adorable. I believe that the wood stove everyone is talking about is the little cod. It’s a marine stove but here’s the link to the manufacturer: http://www.marinestove.com/codinfo.htm. 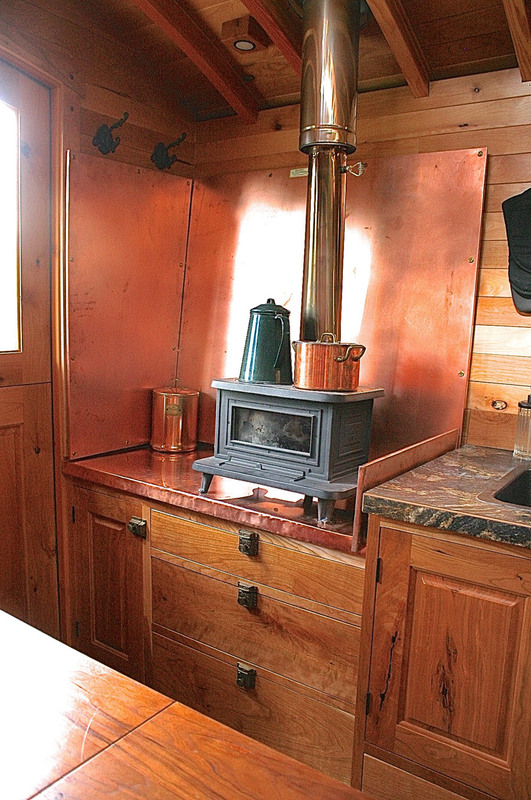 I was wondering where to find copper like what the stove is put on and what kind of wood he used for the interior and exterior, it’s beautiful! I hadn’t heard of the Little Cod, but did notice the site also listed the Sardine, which I’ve seen in many tiny houses. It’s also quite a bit smaller. Love the mollycroft and the Queenie! This is a work of art. Does Andrew offer plans for this or even just build details? Does he have a website? I think this is as sweet as it gets….I would trade my sweet river home for a few weeks travel in something like that. Very thoughtful design and warmth. You can be very proud of it. Any idea on cost? Love the style! 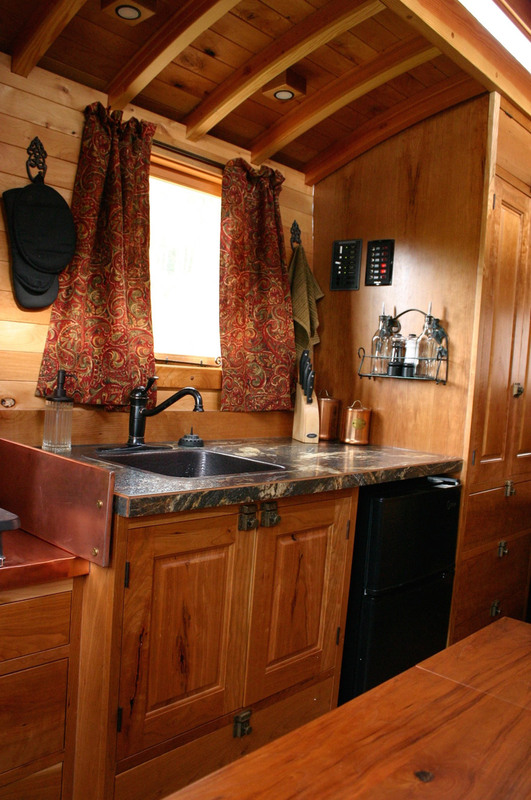 Everything from the copper accents to the tiny wood stove to the curved ceiling. Fantastic eye for design with no compromise on comfort either. 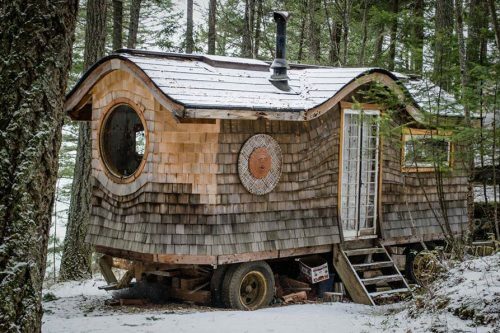 Congrats on a wonderful tiny home. WOW… wonder if the makers of this fine piece realize that they are sitting on a gold mine? Andrew, I LOVE your THow! What is the length of your trailer? 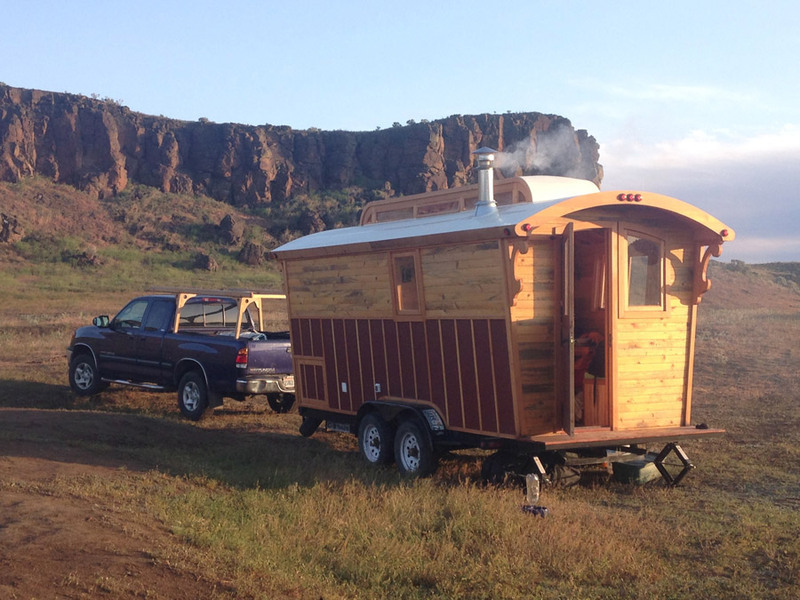 What’s the size of the trailer frame you have it on, and what is the size of the box without the deck portion of the front door? It looks like a good size. 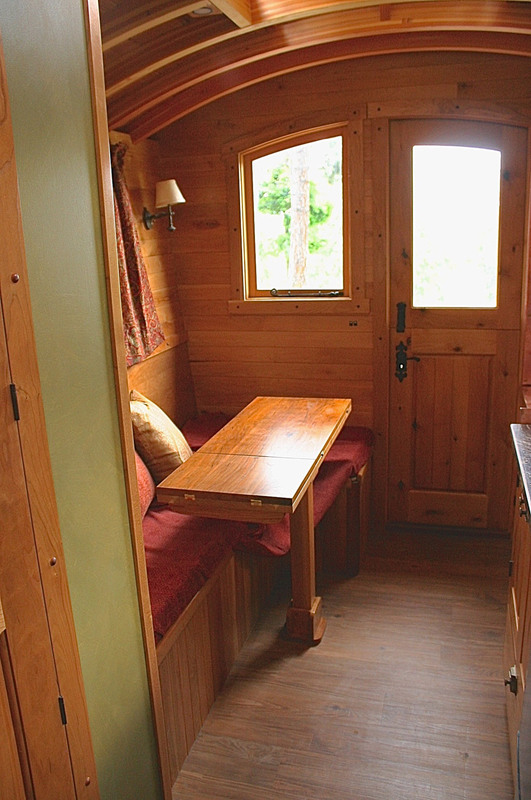 This is the cutest little towable home I have seen, and I have looked at a lot of them, in person and on line. Beautiful workmanship and use of space. Would love this for guests for my beach home.